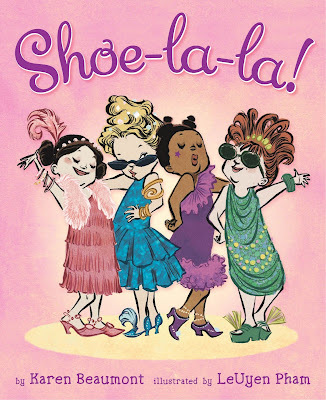 Dolls, shoes are an important part of every girl’s life; just ask Emily, Ashley, Kaitlyn, and Claire – the stars of Karen Beaumont’s Shoe-La-La. The four precocious party-goers – charmingly illustrated by LeUyen Pham – are up in arms searching for the perfect pair of shoes for a très chic soiree – a predicament we all find ourselves in from time to time – and want vous to accompany them on their shopping spree (before allowing you to indulge in one of your very own)! Surprise, surprise, lovers! Café Fashionista has teamed up with Scholastic to bring one (1) of you savvy stylistas a copy of Shoe-La-La - check out the book trailer here – in addition to a $50.00 Gift Certificate to Zappos.com - so that you can splurge on a fabulous pair of shoes – or whatever else your heart so desires! ♥For one (1) entry, leave a comment on this post between now and Friday, January 21, 2011 at midnight PST. ♥ For two (2) entries, Twitter about this giveaway, and leave a comment on this post between now and Friday, January 21, 2011 at midnight PST with your Twitter URL. ♥ For three (3) entries, become a follower of Café Fashionista on Blogger/Google Reader/Google Friend Connect/Twitter, and leave a comment on this post between now and Friday, January 21, 2011 at midnight PST (if you are already a Café Fashionista follower, please say so in your comment). I will randomly pick one (1) name out of a hat (who knows, it could be yours! ), and announce the winner on Saturday, January 22, 2011. Thanks to Big Honcho Media for the pictures. Ooooh, great giveaway! Count me in! Love the illustrations! I would love to win this giveaway.... Have a great weekend! i already follow you and would love to win both the book and the zappos gift certificate! What a cute book and zappos is one of my new favorite places, so count me in!! man.. you host giveaways almost every day.. how great is that! you're like santa!.. thank you! haha I'd love to win this one.. I'm already a follower.. stay cool! So exciting!! I've never seen Shoe-La-La before but it looks so cute! Oooo this book looks ADORABLE!!!! I would LOVE to win it!! I could totally use a new pair of shoes as well!! This is the perfect prize for a shoe addicted readaholic. Yes I love shoes!!! Tweeting about it now and already a follower of your. Awww yay! You are the sweetest! I think I have a huge girl crush on Lauren. I was reading through her Style book the other day, and was all, "Dude, I could totally be her best friend. I'd be so good at it!" The girl is just gorgeous. Oh, these girls are darling! Love the illustration style. I follow on twitter - I'm @brendajburrell. I just toppled over when I saw that book. It's so gorgeous, and would be perfect for a little girl so she could learn how to be stylish young (ah, I wish I had been). Plus, I've never shopped at Zappos before. I wonder if they have combat boots. Hope you have a wonderful Friday and a great weekend. Count this shoe-obsessed girl in! I don't have a twitter, but I am a follower of Cafe Fashionista! I have such a weakness for shoes!!!! Adorable book! I follow you on Twitter & posted on FB on behalf of Pelle Moda. Hooray for an awesome giveaway! Sounds Lovely! Thanks for the giveaway! I follow on Blogger, and I could always use more shoes! I love Zappos! I've gotten great shoes from them. Thanks for the giveaway! So cute...I just love it! You know I am a follower but I just set up a twitter account and I am now following you there too! Erika! This is so cool!! Thank you for stopping by my blog and leaving some comment love! Here is my entry! I have been following you for several months now. I love your finds. Zappos is great for online shoes. I love the 365 day return policy!! That book looks so cute. This giveaway is perfect! I'm already a follower of yours as well. My neice proclaims that she is a mini fashionista so she would love this book. Oh how adorable. Love this giveaway!! Fun giveaway:) and LOVE the shoes in the prior post...definitely would buy them if I hadnt spend all my Christmas money alreadyy! Erika!! Count me in lady...this is a rad giveaway! oh how adorable. I love the illustrations. How Brilliant & Great is this! I just became a follower and there's already presents?! Count me in! One can NEVER have too many shoes. I think Aristotle said that. Great giveaway, I love love love shoe shopping! Looks like a cute book :) And who could say no to shoes? Count me in! I'm also a follower on Blogger. Those girls are the cutest! Aw, how cute. My dd loves shoes. And so do I! oh wow, this is so cool. Love the illustrations. LOVE LOVE LOVE!! What girl doesn't love a great pair of shoes?? tweeted about it and am a follower of course!! great giveaway!! Looks like an adorable giveaway. I'm a follower! love the concept! and i will be buying this book for my little diva! My granddaughter loves this book - and I'd love the gift card! so count me in please! What a cute book, and I love zappos! Oh, and you know I follow your lovely blog! This looks fun. And new shoes would be great, too. I'm a follower of your blog via GFC as nightowl. Oh what a great giveaway! Keeping my fingers and toes crossed!!! I am now following you and follow you on Twitter..Yes I tweeted about the giveaway! Awesome giveaway! Count me in. YES! I have just discovered this page and I love it! Congratulations from Spain! Ohh I've been eyeing some jelly sandles on Zappos. I'm In! Count me in! I love shoes! Count me in a second time, I tweeted! Shooooooz! Please include me. I follow on Google Reader. Yes please--book looks cute and I love shoes! Oooh pick me,pick me. I love shoes. AH-MAZING giveaway love!! I am of course a follower and would love to be entered! 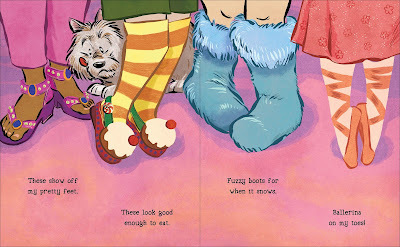 What an adorable book and I would love a new pair of shoes. This looks so cute!! We love shoes!! My daughter would adore this book! Wonderful giveaway E! I will be crossing my fingers for this one :) Following you on blogger and google! Wow this is the first time I got to say I tweeted your giveaway now that Im on twitter!! LOL! And I'm a follower as well because I love your blog and you are such a great friend. 2 of my favorite things in life...books and shoes :D love it!! Great giveaway! Thank you for offering it! My kids and I love shoes. Looks like a very cute book. My daughter would absolutely LOVE this book! Thank you for the chance to win! I definately need a new pair of shoes! 3. I follow on Blogger. Who could resist such a fabulous Giveaway! I love your blog and have recently become a follower on Bloglovin! I love your great deals on trendy items, keep them coming! A girl can never have too many shoes, I would adore winning this certificate to Zappos. Fingers are crossed! This looks like a darling book.